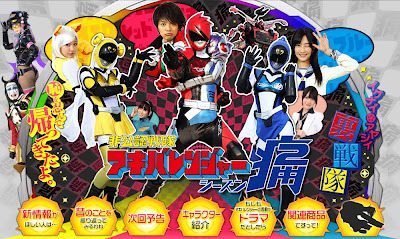 The official website of the unofficial Super Sentai series, Hikonin Sentai Akibaranger S2, began streaming its second promo. The footage was first seen during the recent Hikonin Sentai Akibaranger event last March 4th. As reported a few days ago, there will be guest stars previously played in various tokusatsu series, which includes Yu Kamio (Kamen Rider OOO's Dr. Maki), Keiichi Wada (Gosei Sentai Dairanger's Ryu Ranger), Sakina Kuwae (Jyuken Sentai Gekiranger's Natsume Masaki), Beauty Kokubu, Yoshiyuki Ishizuka, Mitsuko Horie, MoJo and Yukio Yamagata. Masato Wada and Karin Ogino reprises their previous roles as AkibaRed and AkibaYellow. Meanwhile, AkibaBlue will now be played by Shione Sawada, replacing first season's Kyoko Hinami. Hikonin Sentai Akibaranger S2 will premiere this April 6th at BS Asahi. As pleased as I am that Akibaranger is getting a second season, I have to confess that I'm a little depressed Kyoko Hinami's not coming back. Mitsuki was easily my favorite of the trio. SharkInTheWater, I understand your feelings, but I also know that the writing for this show could not be in better hands. I wouldn't be surprised if there were more surprises waiting for us once the show starts. This isn't the first time an Akibaranger had been replaced on a show and led to hilarious results. I'm excited to see how the new dynamics of a new replacement ranger changes the show (again). I have good feelings about this show. I think we're in for another fun ride, especially with so many more Legends and guests. I'll miss Mitsuki but I think I'll like Luna. This trailer made me way too excited for Akibaranger to start again. If this is anywhere near as good as last season, it'll be fantastic. I hope that, if this is also successful, that they continue doing more Akibaranger each year for the foreseeable future. After the way it ended, I don't understand why we need a second season ! To the anonymous person, because everybody liked it and requested Toei to make another season which was what Masato Wada told everybody on the short lived Akibaranger radio show when people sent him emails about how much they loved the show and to request their favorite songs from Super Sentai!